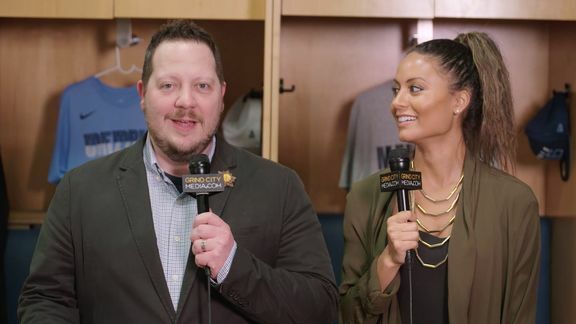 Grind City Media’s Lang Whitaker and Alexis Morgan break down the action from Tuesday night’s win over the Timberwolves. Take a closer look at key moments in the Grizzlies’ win against the Timberwolves in Memphis. 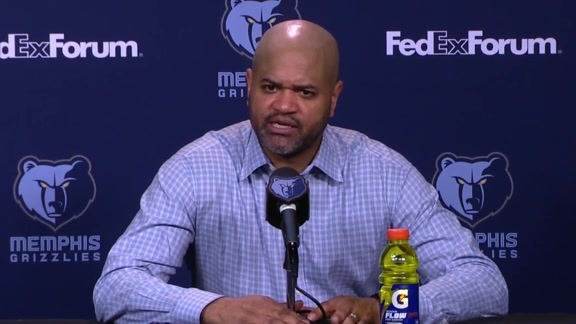 Grizzlies coach J.B. Bickerstaff speaks with the media following the Grizzlies 108-106 win over the Timberwolves on Tuesday night at FedExForum. 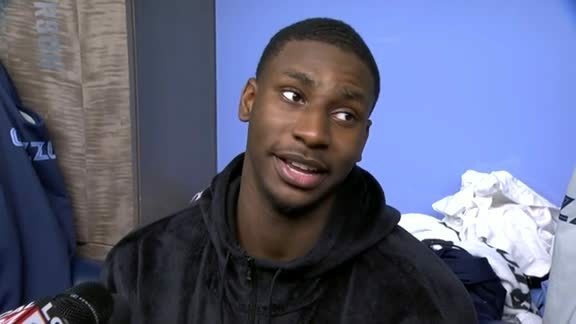 Watch Jaren Jackson Jr.’s speech following the Grizzlies win over the Timberwolves. 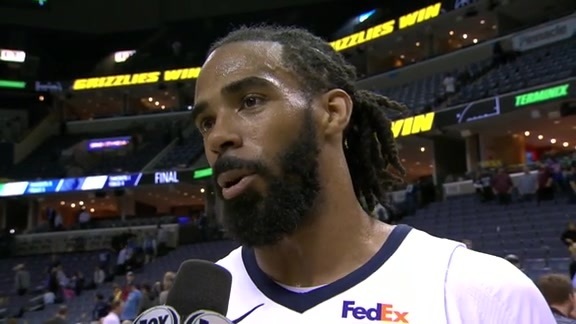 Hear what Grizzlies guard Mike Conley had to say to reporters following Tuesday’s victory over the Timberwolves. Justin Holiday talks to the media after the win against the Timberwolves. Catch the action from Tuesday night’s game at FedExForum in Memphis. 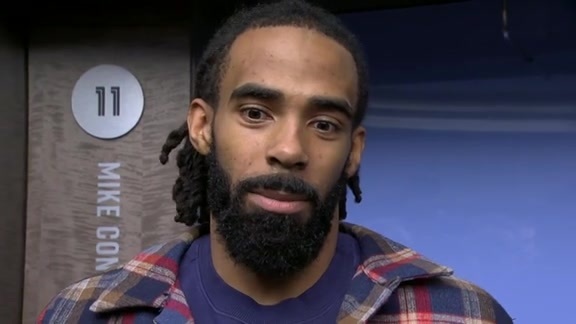 Find out what Mike Conley had to say after the Grizzlies win against the Timberwolves. Mike Conley scores 25 points in a win over the Timberwolves. Yuta Watanabe sends a rainbow shot over the Timberwolves defense for three points in the fourth quarter. 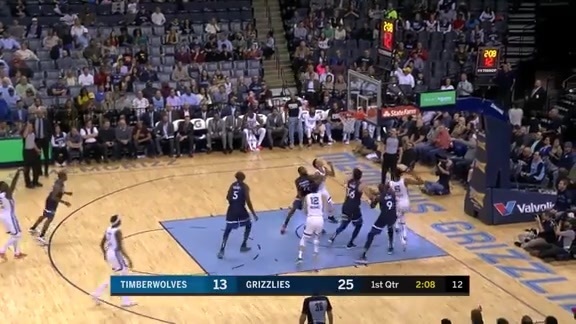 Mike Conley goes wild in the end of the second quarter and makes it rain from distance against the Timberwolves. Mike Conley hangs in the air for the tough three and foul. 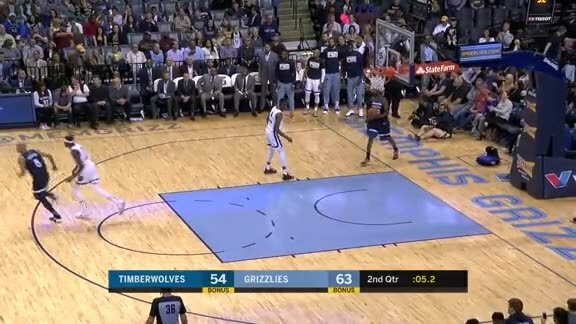 Jaren Jackson Jr. takes advantage and sinks the baseline three-pointer over Timberwolves. Ivan Rabb finds a cutting Bruno Caboclo for the reverse layup. Shelvin Mack pulls up and knocks down the three against the Timberwolves. Jaren Jackson Jr. finds Ivan Rabb who slams down the easy jam. 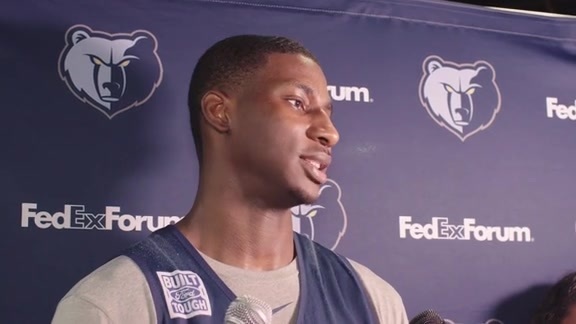 Grizzlies forward-center Jaren Jackson Jr. speaks to the media as the Grizzlies prepare for the Timberwolves. 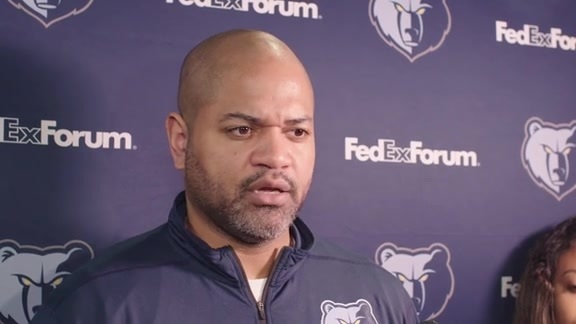 Head coach J.B. Bickerstaff talks to the media heading into tonight’s game against the Timberwolves at FedExForum. 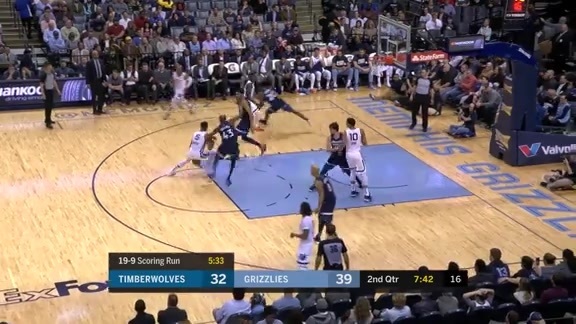 The Grizzlies forced the Timberwolves into 17 turnovers, scoring 25 points off the giveaways, while committing eight turnovers of their own, which led to 10 points for Minnesota. 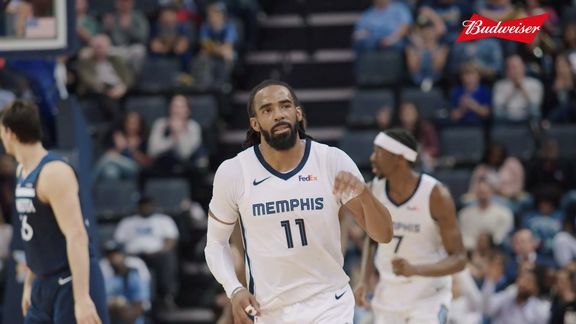 The Grizzlies kicked off the game with a 23-4 run that lasted from 11:38 to 5:09 (6:29 run) in the first quarter, with all five starters scoring during the stretch. While Minnesota would tie the game up once with 15.7 remaining in the game, Memphis never trailed. 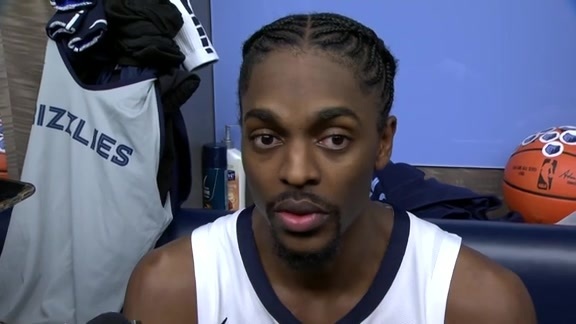 With the score tied at 106 apiece, Justin Holiday knocked down a pair of free throws with 0.1 seconds left in the game to help the Memphis Grizzlies defeat the Minnesota Timberwolves on Tuesday night in FedExForum. The Grizzlies improved to 22-33 on the season and 13-14 at home. The Timberwolves dropped to 25-28 on the year and are now 8-18 on the road. Memphis now leads the season series 2-1. The Grizzlies also recorded their third wire-to-wire victory of the season. Entering the fourth quarter up by just two, Memphis started the quarter with a 9-0 run from 10:57 to 7:34 (3:23 run) to push the lead to 94-83. The Timberwolves went on 7-0 run late in the quarter, capped by a Towns dunk, to bring the game back to within two at 106-104 with 1:19 left in the game. 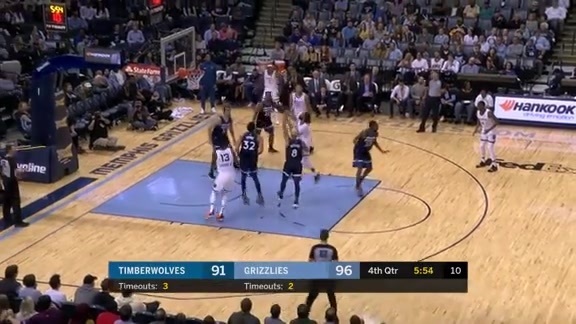 Conley committed just his second turnover of the night to give Minnesota the ball with 25.8 seconds left. Towns connected on both free throws after getting fouled with 15.7 remaining to tie the game at 106-106, marking the first tie of the game. 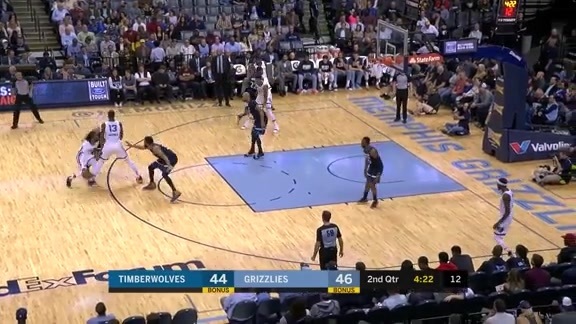 Conley created space and got a clean look from three and missed, but Holiday was fouled as he corralled in the rebound, sending him to the line with just 0.1 seconds left. Mike Conley led Memphis with 25 points while dishing out a game-high nine assists. Conley has scored at least 20 points in 31 games so far this year. Jaren Jackson Jr. finished with 23 points, six rebounds and a couple blocks. It’s the 10th time the rookie has eclipsed the 20-point mark this season. In his first start this season, Ivan Rabb scored a career-high 19 points to go with 11 rebounds and a pair of steals. Rabb now has three double-doubles on the campaign. Justin Holiday was just shy of a double-double, finishing with 17 points and nine rebounds. Holiday has scored 15 or more points in three consecutive games. In his first career start, Julian Washburn chipped in with seven points and four boards. Minnesota outshot Memphis overall, going 39-for-87 (.448) from the floor while the Grizzlies were 36-for-86 (.419). The Grizzlies had more success from the perimeter though, making 15-of-34 (.441) three-pointers compared to 9-of-29 (.310) triples for the Timberwolves. 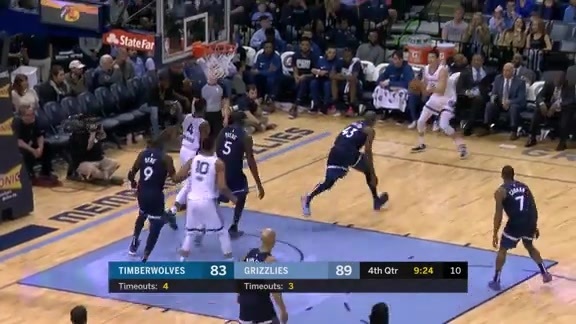 The Grizzlies forced the Timberwolves into 17 turnovers, scoring 25 points off the giveaways, while committing eight turnovers of their own, which led to 10 points for Minnesota. The Timberwolves outrebounded the Grizzlies 55-39 for the game, leading to a 26-16 advantage in second chance points. Minnesota made 19-of-20 (.950) free throws while Memphis finished 21-of-29 (.724). Karl-Anthony Towns recorded his 35th double-double of the season, leading all scorers with 26 points and 18 rebounds. Towns also made all 10 of his free throw attempts in the game. Dario Saric came off the bench to supply a season-high 22 points along with seven rebounds. Luol Deng also scored a season-high off the bench, finishing with 18 points (8-10 FG). The Timberwolves outscored Memphis 29-19 in the third quarter on 13-of-25 (.520) shooting, but only managed to make 1-of-11 (.091) threes. The Grizzlies shot just 7-for-22 (.318) in the quarter, and were outrebounded 19-8 by Minnesota. The Timberwolves went on a 13-2 run over the last 3:31 of the third to trim the Grizzlies lead to 85-83. Memphis went 21-for-43 (.488) in the first half, and tied their season-high for three-pointers made in a half by knocking down 10-of-17 (.588) treys. 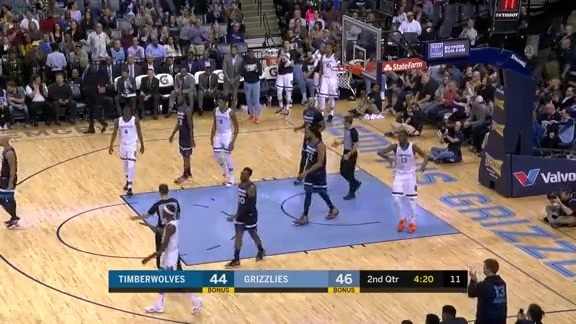 The Timberwolves sank all 15 of their free throw attempts in the half, marking the best percentage at the line in a half by a Grizzlies opponent, while the Grizzlies were 14-for-18 (.778) from the charity stripe. Conley had 16 first-half points and tied a season-high for threes made in a half by a Grizzlies player, going 5-for-7 (.714) from beyond the arc. The Grizzlies kicked off the game with a 23-4 run that lasted from 11:38 to 5:09 (6:29 run), with all five starters scoring during the stretch. The Grizzlies went 11-for-24 (4-8 3P) in the quarter, while holding the Timberwolves to 7-for-19 (1-2 3P) shooting. Memphis jumped the passing lanes well, forcing six Minnesota turnovers (five steals) and converting them into 11 points. 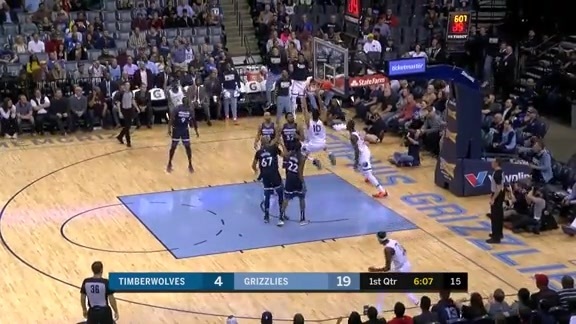 Wiggins tipped his own shot back in with 0.1 seconds left, but Holiday, Rabb and Jackson Jr. all scored eight points in the opening quarter to put the Grizzlies up 31-19. Minnesota improved in the second quarter, going 10-for-20 (.500) overall and 4-for-8 (.500) from deep as the Timberwolves went on a 10-2 run midway through the period to cut the Grizzlies’ lead to 43-41. Conley caught fire in the quarter, scoring 13 points (4-5 3P) and hitting three treys in the final 50 seconds to help the Grizzlies lead 66-54 at halftime. The Grizzlies will face one of the three teams they have yet to play this season on Thursday, February 7 when they take on the Oklahoma City Thunder inside Chesapeake Energy Arena at 7 p.m. CT. Tune in to FOX Sports Southeast presented by Pinnacle Financial Partners or listen on 92.9 FM ESPN to follow the action. Fans who want to support the Memphis Grizzlies and purchase single-game tickets can do so now by calling (901) 888-HOOP or going online to grizzlies.com/tickets. Single Game Tickets are also available for purchase at the FedExForum Box Office, ticketmaster.com, online at grizzlies.com/tickets or by calling 1-800-4NBA-TIX. For more information on the Grizzlies, ‘like’ Memphis Grizzlies on Facebook or follow on Twitter and Instagram (@memgrizz). It was spirited. I think you can tell early in the game – the effort the guys came out with, the force the guys came out with, the spirit that they came out with. I think it was – guys were lifted and they were pushing one another. It was fun to see. I think it’s obvious a guy who means a ton to this organization, this fan base, the people in this city and the respect that they have for him. I haven’t been here through all of it, obviously. I’ve seen a lot of it from the outside – the blood, sweat, tears, injuries, the scraps, the battles that guy has been through for this team and for the sole purpose of helping this team achieve as much as it possibly can. Playing for the fan base, understanding the connection to the city and holding that extremely valuable and never sacrificing that. I think that emotion and that reaction from the crowd, that’s what it shows. 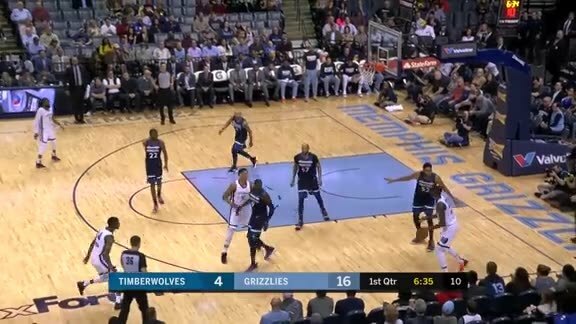 Mike [Conley] was getting the ball. Doug Collins came into my mind when he told them give the ball to Michael and get the hell out of the way. That’s basically what we told them for Mike there. I think you go down the list and at some point in time, everybody contributed. You look at Ivan Rabb, he finished with 18 and 11, something like that – double-double. Jaren Jackson [Jr.] was attacking and was aggressive, started out making shots from the perimeter. Julian Washburn hit a big three for us and then we were able to run offense through Justin [Holiday] for a while where he was making jumpers, creating triggers where he was getting in the paint and he was opening up for other people. I think everybody that stepped on the floor tonight gave us something. Yuta [Watanabe] came in and hit a big-time three for us in the corner when we needed it. Everybody who played tonight contributed. I think he’s getting comfortable and his confidence is growing, the belief in himself that he can compete on an NBA level is growing. We believe that. We believe he’s got an NBA skillset. There’s obviously a development where he’s got to grow and continue to improve. His work ethic, his attitude, his commitment to it is second to none. It just takes guys a little bit of time to figure it out, but as hard as he works and as dedicated as he is to it, I’m sure he’ll figure it out. I think, again, being the professional that he is, being a guy who genuinely cares about the game of basketball and cares about his teammates and trying to do the things the right way all the time, he wanted to be there. He wanted to support those guys. Since I’ve been here, you’ve had to drag him off the court to not let him play, whether it’s a game, whether it’s practice. He’s a guy who shows up every single day and goes to work even when he is banged up. When most guys would ask for a day off, a night off, Marc [Gasol] does whatever he has to do throughout the day to get himself to be prepared to play that night. I think it means something to him. Again, I’m not as deep in it as you guys are as long as you guys have been here. The fan base has watched him grow up and seen him, but I understand it. I know there’s a deeper connection that he has with this organization, with this city and with this fan base that goes way beyond words. You have a job to do every day, that doesn’t change with the circumstances. We show up on the court and coaches are wavering, they lack belief, we lack discipline. It shows on the floor. For us, nothing changes. We have a job to do. Because we were short-handed, we wanted to make sure that we were pumping guys up, getting them going, getting them spirited, bringing a little more energy. We had some young guys out on the floor together. We wanted to give them a ton of confidence, show them how much we believe in them and support them – that was the sole focus of tonight, trying to help the young guys be as successful as they possibly can and give the older guys the responsibility to lead and push and pull at the same time. That was it. Day-to-day, we do the same thing. We show up and we grind. I personally just don’t get into people’s business, that’s just how I am. I don’t ask questions. I know what it feels like to be traded. I know what it feels like to be in that situation. Some people are just better off, if they want to tell me something or tell somebody else something, they will – that’s just how I go about things. I’d rather not ask anybody about it because it’s tough enough as it is. That it sucked that y’all fouled me. Y’all should not have fouled me. I knew for a fact that I was making those free throws. I wanted to laugh. I don’t know if I was smiling or not, but I knew I was making them. I was like ‘thank God they fouled me’ too, because I couldn’t see the rim when I got the rebound. Yeah, everything except that last shot, man. I wanted that one really bad. But, the guys picked me up tonight. You could just tell by the way that we started the game, the energy we played with, that meant a lot to me to see the guys fighting so much. They know what it meant to me and to Marc [Gasol]. It’s just a tough situation all the way around, and they made the night fun and I couldn’t have asked for better teammates. It was a little surreal. Just the first half, looking at the bench and seeing Marc at the end of the bench just cheering was like, ‘Damn man, this is it.’ It would cross my mind almost every timeout. I’d just look into the crowd and be looking back at the bench, be looking at coaches and players, seeing my wife and kids in the stands in the same spot they’ve been in for 12 seasons. I was just trying to take it all in and enjoy it because if it is the last time, I didn’t want to leave anything. No regrets. I’m just happy we got the win. Yea, the whole day. The whole day was kind of like that. I’m a big routine guy. I shake every ushers’ hand before the game, and just going through that routine like, ‘Damn this might be the last time I do that.’ The last time I eat this pregame meal next to these guys and the last time I get this massage and all these things I do every day. It was hard not to think about it. It meant everything. A lot of the guys that are on this team now have no idea what we went through for 12 seasons. We started at the bottom and got almost all the way to the top. We built something from nothing, and to see that where we are today and to fast-forward to now is just like they understood it. And they felt it tonight, like what we’ve done and what we’ve accomplished. The fans and everybody. That’s what made it so special at the end of the day, the fact that they understood what we’ve meant to Grizzlies basketball. I honestly do not know. Every day I wake up and there’s a new development and I’m like, ‘yeah I’m gone,’ and the next day I’m like ‘nah, I think I’m going to be here.’ So, I’m trying not to think about it. I’m just trying to get through until Thursday and see what happens. So, we’ll see. If that’s the way it works out; it’s been a hell of a journey. It’s been a hell of a ride to have had so many great teammates. All of us have made each other better. All of us have made this what it is and just to be standing up there with, basically a group of guys that I’ve played with for only a few games now, some of them, a lot of them being rookies, and just being out there on the court is just completely surreal. They’ve been in constant contact and I have at least some idea of who’s calling and if things are real or not. I got to eat at the restaurants I want to eat at, spend time with my family and do things that might be the last time I get to do them if things were to go down by Thursday. Thank you. Just thank you for sticking with me. I love each and every one of you. I feel like I’ve signed or taken a picture with every person in Memphis twice. But, I really do appreciate the love. They’re the best fans in the world and we’ll see. Mike Conley led Memphis with 25 points while dishing out a game-high nine assists. Conley has scored at least 20 points in 31 games so far this year. Jaren Jackson Jr. finished with 23 points, six rebounds and a couple blocks. It’s the 10th time the rookie has eclipsed the 20-point mark this season. In his first start this season, Ivan Rabb scored a career-high 19 points to go with 11 rebounds and a pair of steals. Rabb now has three double-doubles on the campaign. Justin Holiday was just shy of a double-double, finishing with 17 points and nine rebounds. Holiday has scored 15 or more points in three consecutive games. In his first career start, Julian Washburn chipped in with seven points and four boards. Karl-Anthony Towns recorded his 35th double-double of the season, leading all scorers with 26 points and 18 rebounds. Towns also made all 10 of his free throw attempts in the game.